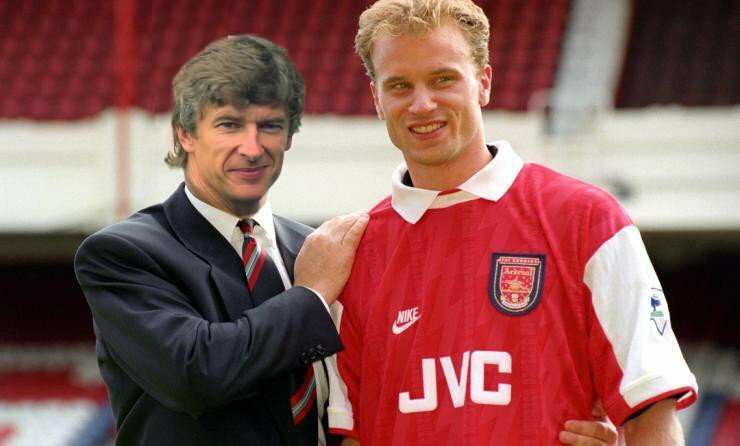 However, one signing that has always been considered a Wenger signing may have actually happened whilst Bruce Rioch was still the Arsenal manager. During the summer of 1996 the relationship between Arsenal’s board of directors and incumbent manager Bruce Rioch became strained due to the latter’s procrastination in signing the contract that had been negotiated between the two parties a year previously and the lack of regular communication between the two parties. Rioch finally signed the contract at the end of July. He was summoned to Highbury on 12 August, expecting to witness the directors countersign his contract. However, by 3.57pm he was Arsenal’s ex-manager. It should be noted that this headline never actually appeared in the paper itself. Arsenal also signed two new players on the day that Rioch was sacked – Remi Garde and Patrick Vieira – apparently on Wenger’s recommendation. Vieira’s transfer was most strange. In an interview later that week he said that negotiations had taken place whilst Arsenal were playing in Florence on 7 August – five days before Rioch’s departure! This must have meant that the Arsenal board knew at that time that they were looking to give Rioch the boot and bring in Wenger. 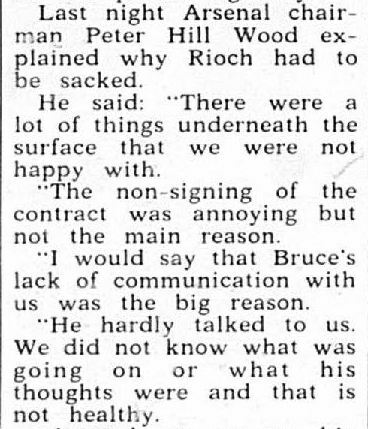 If Rioch had read the Daily Mirror on 10 August he should have twigged that his time was up. Unless, of course, Vieira was a player that Rioch wanted to sign! In fact, with Vieira signing on the same day that Rioch was sacked he may have been signed whilst Rioch was still manager, technically making him a Rioch signing! We’re looking forward to seeing some photoshopped pictures of Bruce Rioch signing Patrick Vieira on 23 June!